With age comes wisdom and wisdom teeth! Wisdom teeth, also known as third molars, are the last teeth to come through the jaw. Generally, the eruption of wisdom teeth is between the ages of 17 to 24 years old and can occur at all four corners of the mouth. For some people with enough arch space, wisdom teeth can erupt and be functional without causing any complications. In those instances, it is completely fine to leave as is and removal may not be required. Sometimes wisdom teeth can be quite sinister and present without symptoms, however absence of pain does not mean absence of problems. 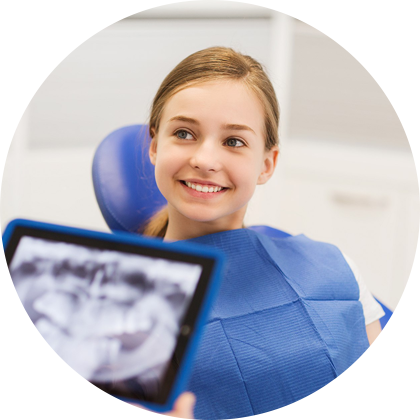 At Aqua Smiles Dental, we will diligently evaluate your wisdom teeth for you to see if removal is indicated. If removal is needed, our experienced dentists with surgical training will thoroughly explain everything to you so that you can clearly understand what is involved. We are very mindful that extractions can be a daunting procedure for some people. With that in mind, we will walk through the process at a pace that is most comfortable for you so you can feel at ease knowing you are well supported.